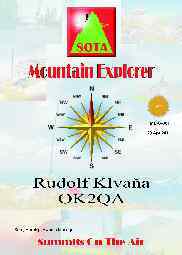 The essence of the award is to recognise the activation and qualification of Summits, in accordance with SOTA General Rules and the local association’s rules, in a number of different associations. Example: To claim the Bronze Award an activator would need to have activated one summit is at least five qualifying associations – these could be GM, G, F, DL and ON as an example. Following the increasing trend for Activators to visit summits when on a foreign vacation or business trip we have decided to introduce a variation of the award which recognises visits to continents other than the Activator’s home continent. 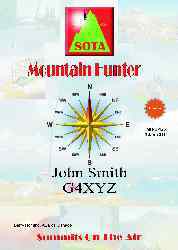 The Activator will need to activate in a number of Associations on different continents, including their home continent, the distribution of the number Associations activated over the Continents activated is left to the individual provided at least one Association per continent claimed is activated. Chaser should contact (or SWL, hear) at least 2 different summits in each of 5 associations. The higher level awards require that at least one association claimed is on a different continent from the claimant’s normal residential QTH. Level 1 can be claimed with contacts only on the claimant’s own continent (1 continent); higher level awards require intercontinental contacts. Chaser should contact (or hear for the SWL award) at least 2 different summits in each of 5 associations using just VHF/UHF any mode.